Welcome to our office! 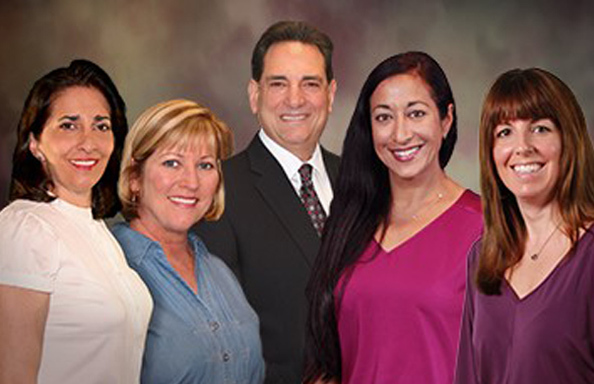 I am the newest member of the staff and am thrilled to be a part of such an exceptional team of dental professionals. As the office administrator, I will generally be the first person that greets you on the phone and welcomes you to the office for your visits. I will do my best to assist you with your scheduling needs, any financial issues as well as your dental benefits. I have worked in dentistry for over fourteen years and have been very fortunate to work for some truly great dentists and Dr. Ferullo is no exception! I am a St. Petersburg native. I graduated from St. Petersburg High School IB Program in 1992 and the University of Florida with a B.S. in psychology in 1996.I am the proud mom of a 15 year old son currently attending St. Pete High. In my free time I enjoy spending time with my son-watching him surf at the beach,lots of time at the baseball field, cheering on the Gators and anything involving our beautiful coastline. To those visiting our Web site, we are pleased to have you here. I’m Cindy Ninis. I am a native of St. Petersburg and started my dental career when I was just 15, working part-time as a dental assistant. After graduating from high school, I entered Dental Hygiene School at St. Petersburg College and graduated in 1978. I began my career working for the late Dr. John Stewart. In 1988, Dr. Ferullo bought the practice from Dr. Stewart. But for me nothing changed; I simply went to work for Dr. Ferullo and have been with him ever since. Many people who stay in the same position throughout much of their career do so because they love what they do. And I’m not any different. I’ve worked since 1988 for the same dental practice for many reasons. I have found it to be a wonderful experience to work with three generations of patients. Many of these patients are like family to me. I’ve watched patients grow up and then have their own children. I also work with a great group of people in a beautiful office setting. My husband, Rich, and I have two children, Cassie and Colby, who keep us busy. But when I do find time for myself, I like to read, care for my African violets and shop. Hello, my name is Susan Wright. I have been working in dentistry for most of my adult life, going back to 1973. As a teenager, I was fascinated by the profession, always asking my dentist questions. The next thing I knew I was working for him as his dental assistant. I got my education as a dental hygienist, by earning an A.S. degree in Dental Hygiene at Santa Fe Community College in Gainesville in 1980. I think anyone who has a job as a dental hygienist has to like people. They have to be a “people person.” That pretty much describes me and meeting people is one of the best things about my job…that and helping people…in my case, getting people’s teeth and gums healthy. With a husband and two teenage children, most of my free time is taken up with family. My husband and I try to be involved with our children’s school activities as much as possible. I also volunteer my time with Pet Pal Rescue in St. Petersburg. It’s a non-profit organization that rescues dogs and cats from animal shelters, where they may otherwise be euthanized for various reasons. I will look forward to meeting you soon! Hello, my name is Jessica Massaro, I started my dental assisting career back in 2005. I have worked in a couple practices which I enjoyed prior to joining Dr. Ferullo’s team. I am very blessed and happy to be part of a great office. Dental Assisting is very rewarding and I enjoy my job greatly. My relationships that I build with my patients are very important to me. I want them to feel comfortable and have a pleasant experience here. Outside of work I enjoy having fun with my husband Chris and very busy son Lucas. Being a wife and mom is very special and busy too, but there is always time to spend on yourself! I look forward to meeting all of you.